Kota Kinabalu (Thursday) - The Sabah Economic Development and Investment Authority (SEDIA) today received a courtesy visit from Persatuan Pedagang dan Pengusaha Melayu Malaysia (Perdasama), otherwise known as the Malay Businessmen and Industrialists Association of Malaysia. The delegation, led by President Tan Sri Matshah Safuan, was received at Wisma SEDIA by SEDIA Chief Executive Datuk Dr. Mohd Yaakub Johari with several management and staff members. The visiting delegation sought to have a discussion on business and SME opportunities available in Sabah. Perdasama has a membership of nearly 16,000 bumiputera companies, with active membership of up to 4,800 members in 16 branches across Malaysia. The delegation that visited SEDIA comprised of members from their Sabah, Labuan, Selangor, Terengganu, and Perak branches. The association focuses on the rights and interests of its community of bumiputera traders and entrepreneurs, and is active in mobilising efforts and expertise of its members towards driving transformation and participation of bumiputera in the national economy, to bridge the income gap. Perdasama's initiatives have benefited from its leadership, which consists of successful bumiputera entrepreneurs from various industries. SEDIA was established on January 15, 2009, through the adoption of Sabah Economic Development and Investment Authority Enactment 2009. The Enactment was assented by the Tuan Yang Terutama Negeri Sabah on February 23, 2009, and gazetted on February 26, 2009. Through the enactment, SEDIA is vested with the necessary power to serve as a decision-making and execution institution that is tasked with realising the SDC vision and mission, by being the One-Stop Authority to plan, coordinate, promote and accelerate the development of the Sabah Development Corridor (SDC). SDC had launched on January 29, 2008 during the Ninth Malaysia Plan as one of Malaysia's five regional economic corridors, with the aim to accelerate the growth of Sabah's economy, promote regional balance and bridge the urban-rural divide, while ensuring sustainable management of state resources. During the discussion, the Perdasama group was introduced to the Sabah Agro-Industrial Precinct (SAIP) in Kimanis. With an estimated area of 185 acres, SAIP is envisaged as a centre of excellence in agro-biotechnology that optimises the state's biodiversity and abundant natural resources to produce higher value-added food and specialty products based on botanicals, aquatic plants and animals. Members of the delegation were also interested in participating in the Agro-SAIP training programme, which have thus far benefitted 2,021 participants from throughout Sabah over the span of 36 courses since its inception in 2012. The Agro-SAIP training programme, which assists local SMEs to enhance their skills, expertise and capabilities, was established with the aim to empower technopreneurs in the agro-based industry, by giving the necessary exposure and transfer of knowledge, especially on the processing of agro-food and specialty natural products (SNPs). Through the training programme, participants are given access to experienced speakers and industry representatives in various sectors; speakers well-versed in pharma-herbs, controlled environment farming, post-harvest handling technology, agro-organic and agro-food industries, business and marketing through e-commence, and bio-science and biotechnology had been invited to come and share their experience and expertise with participants. Perdasama members were also informed that SEDIA had developed initiatives and has been actively involved in SME development in Sabah, since during the Second Phase of SDC (2011-2015) and into the current Third and final Phase of SDC (2016-2025). The SME programmes are also in line with one of the three principles of SDC, which is capturing economic value activities. The SDC SME programmes are to help entrepreneurs, start-ups and companies to discover business ideas, validate as well as scale up their ventures. Following the discussion, members of the visiting delegation were keen to have active involvement in several of the SDC SME development programmes, and had established communication channels with several of SEDIA representatives. Moving forward, Perdasama hopes to be informed of future programmes such as seminars, workshops and SME assistance services so as to encourage their members to utilise these available initiatives. Since the commencement of the Second Phase of SDC in 2011, SEDIA has been aggressively promoting investment into SDC. The introduction of SDC has no doubt created greater awareness on investment opportunities in Malaysia's second largest state. Unlike other development corridors in Malaysia, SDC - an 18-year economic development programme - covers the whole state of Sabah. The corridor initiative uses a regional development approach to ensure economic development benefits everyone in the state. 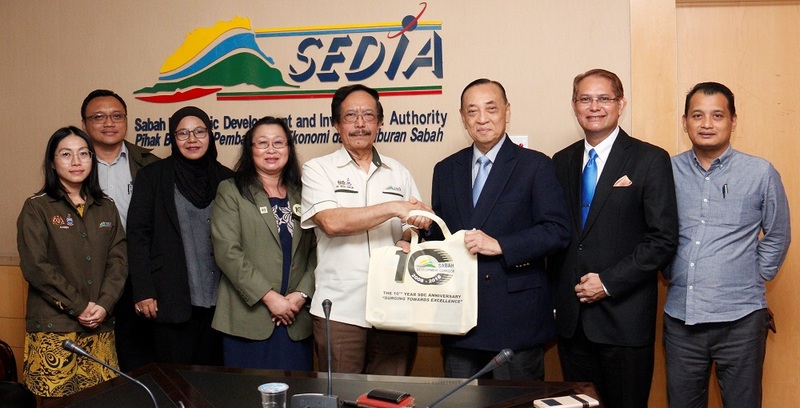 Subsequent to the launching of SDC, SEDIA has been promoting Sabah, under the SDC investment tagline, "A preferred destination for business, culture and nature". With the advantages that Sabah has to offer, SEDIA has managed to attract tremendous interest amongst local and foreign investors into Sabah.